When I was a kid, the everyday meal cooked using the ingredients grown in your own backyard was something that I considered ‘blah’, well, boring! There was nothing interesting in eating the food cooked using the ingredient that grew right in front of my eyes. 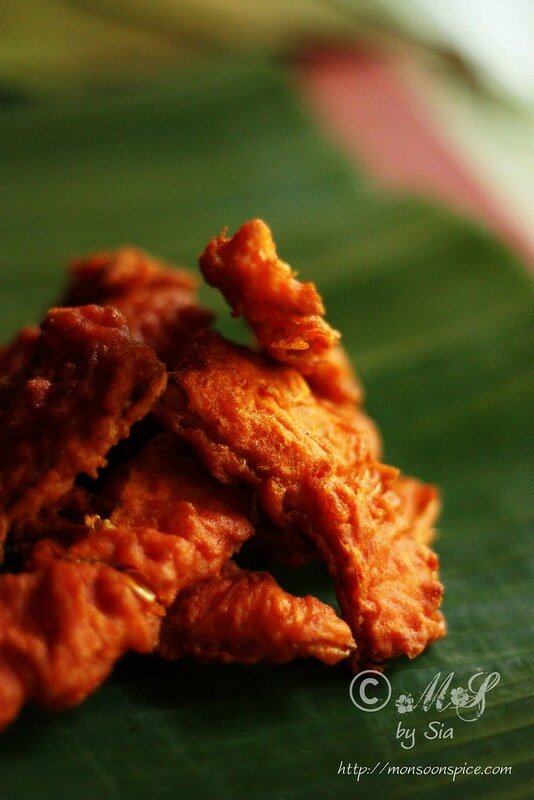 Gujje Podi/Tender Jackfruit Fritters ~ Deep fried goodness! 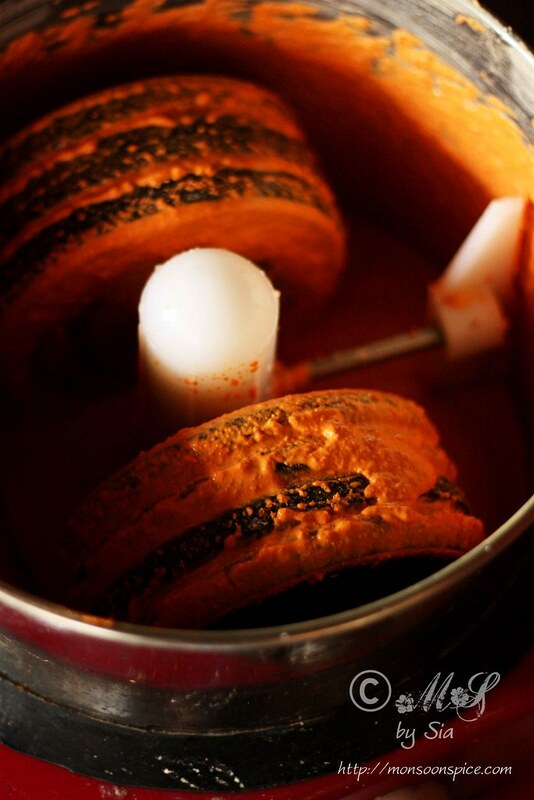 Bendi, simple coconut based curry made using large pumpkins growing in a vine? Boring! Huli Menasina Kodhel, lightly spiced coconut curry made using ivy gourds covering the portion of wall and roof in the back of the house? Well, boring! Tomato Majjige Huli, sour buttermilk and coconut based curry with tomatoes plucked right from the plant in a big planter? Let’s not even talk about it! Among all these boring and uninteresting and uninspiring food was something that always got my full attention in spite of growing in the very same backyard! 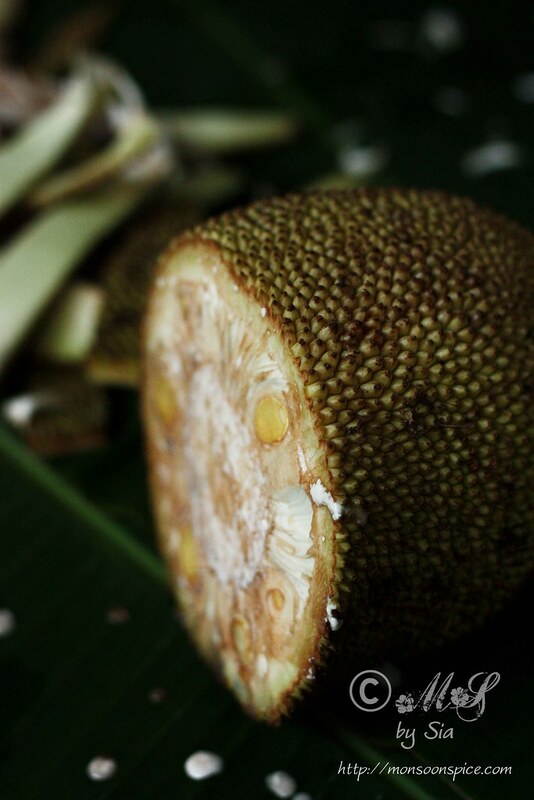 I am talking about Tender Jackfruit, unripe jackfruit used extensively in making several savoury preparations. Gujje (pronounced as Gu-jjey), as is it called in local language, is only available during few months of summer in India. It is bit chewy and meaty textured when it is little undercooked especially when prepared as a Palya and is melt-in-mouth tender when cooked just right. 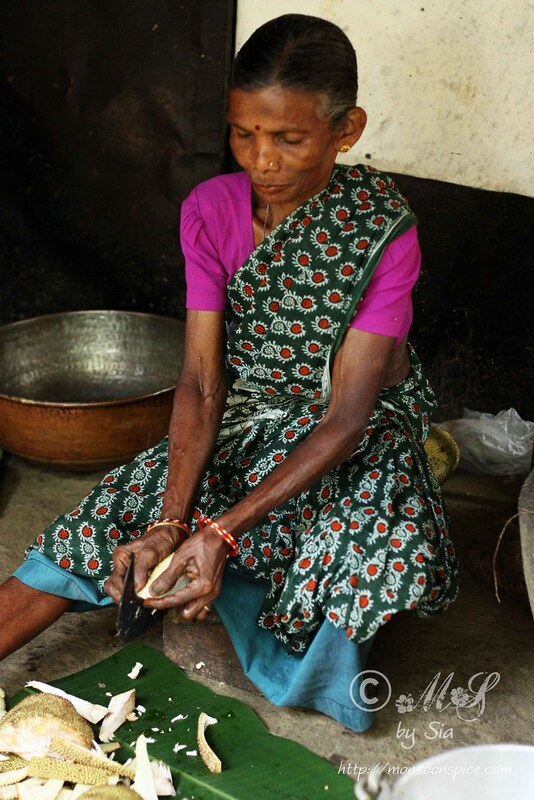 Back in my native, the large fruits and vegetables are cut using the special cutting device which we call ‘Met Katti’ where the sharp half-moon shaped knife is attached to one end of the short wooden seat. This instrument is used for cutting, dicing, and peeling large fruits and vegetables which are quite difficult to chop using hand held knives. Preparing the tender jackfruit for cooking is bit difficult if you are a beginner and is also quite time consuming. 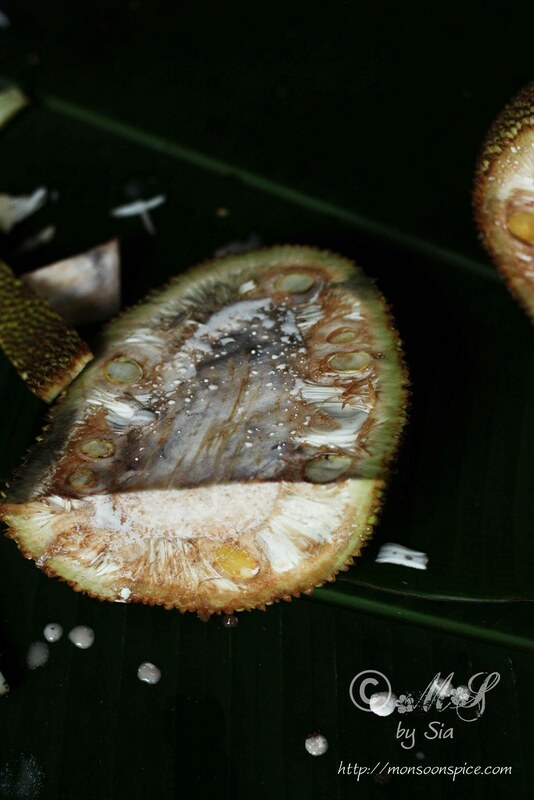 It is a ‘sticky’ job as the milk like substance inside the jackfruit is quite sticky like a glue. Yes, preparing the jackfruit for cooking is quite tedious and messy, but it is well worth every moment when you at last get to taste it once it is cooked! Old newspapers are neatly spread to cover the floor from getting the floor stained from the white milky glue from tender jackfruits. Both the hands are oiled well for the same reason before cutting the tender jackfruits into two equal halves using the Met Katti. Then each halves are diced into large pieces before peeling the thorny green skins. 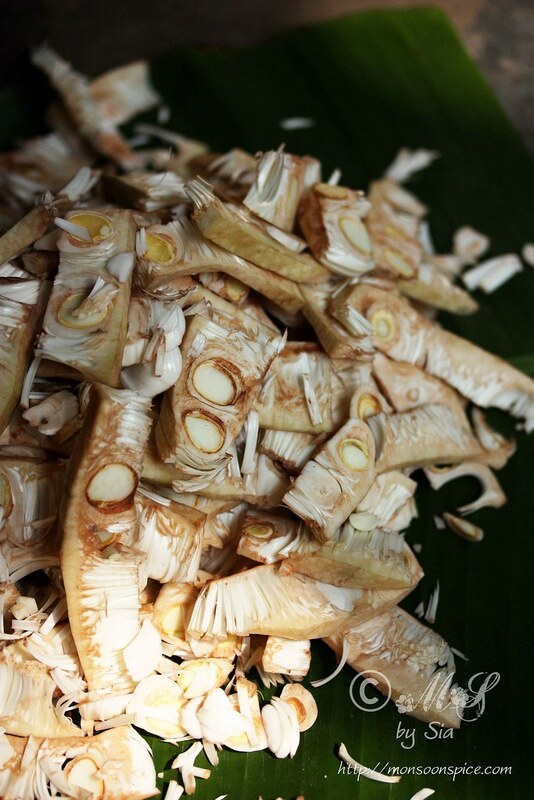 Once you have peeled all the pieces, then we can proceed to cut them into thin slices or small pieces for cooking. The cut pieces of tender jackfruit is immersed in a large bowl of diluted buttermilk or just plain water to prevent them from changing the colour. Some of my most favourite ways to cook and eat this delightful Tender Jackfruit is the traditional and local preparations like the Tender Jackfruit/Gujje Gassi (spicy coconut based curry), Gujje Palya (sautéed with tamarind juice and spices and garnished with freshly grated coconut), Gujje Kodhel (another coconut based red gravy, an Udupi-Mangalorean delicacy), Gujje Pickle and Melara/Majjige Huli (yes, another coconut and buttermilk based gravy). It was only recently I came across this amazing tasting Gujje Podi or Tender Jackfruit Pakoda/Fritters. It was my introduced to me by my sister-in-law when we were holidaying in India this December. Unlike the usual Podi/Pakoda where gram flour or chickpea flour is used in making the fritters, here the base for spicy batter is made by grinding the soaked rice with other ingredients. If you have someone to help you in cleaning and preparing the tender jackfruit for cooking, then this recipe of Gujje Podi or Tender Jackfruit Fritter is one of the most simple and best tasting Pakodas you would ever have tasted! The ingredients used in making these Gujje Podi or Tender Jackfruit Pakda/Fritters is very minimal, but that’s what makes it such a tasty fritter. 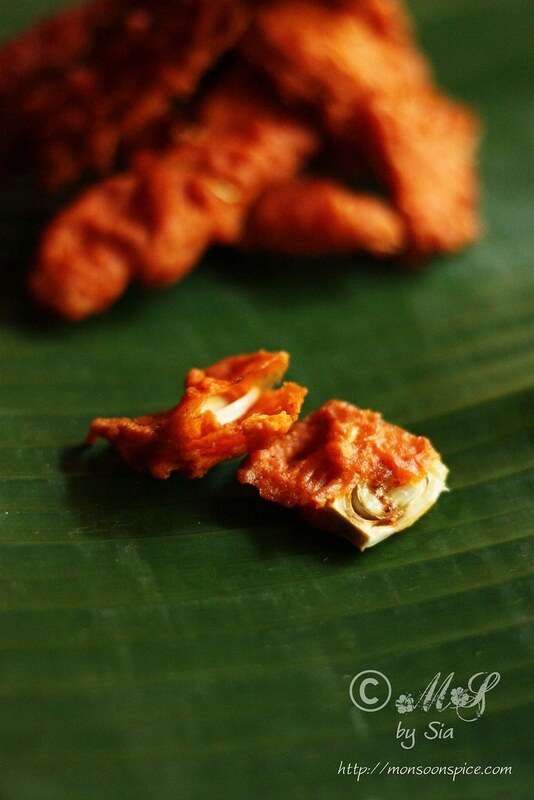 Thinly sliced tender jackfruit pieces are coated in a spicy rice batter before deep frying to crispy, golden perfections. 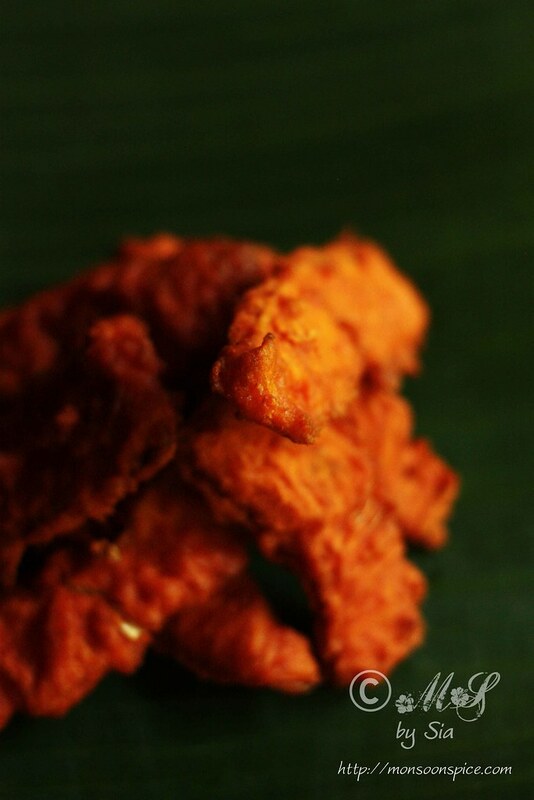 The outer rice batter coating gives it a nice crunchy texture to the succulent, melt in mouth tender jackfruit inside. Since it is the season for Gujje or Tender Jackfruit in India, I highly suggest you to give this recipe a try before they vanish from trees and markets! Drain and reserve all the water from soaked rice. 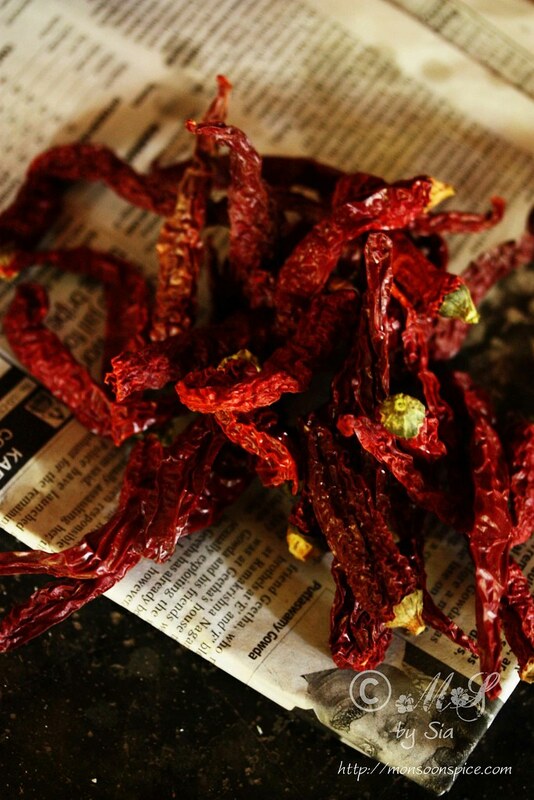 Grind the soaked rice with dry red chillies, cumin seeds, hind and salt to taste to smooth batter using enough water. The batter should be of thick pouring consistency. Keep it aside until needed. 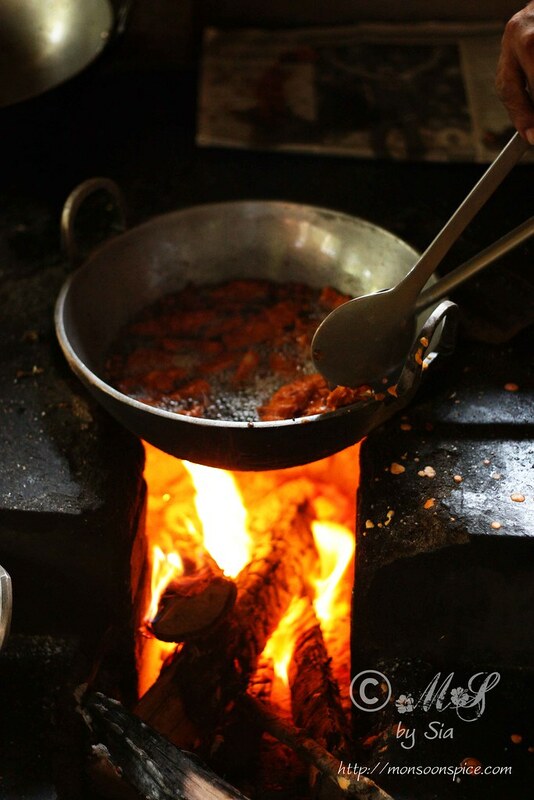 Heat oil in a large pan or wok on medium flame. Once the oil is hot, dip tender jackfruit slices into the spicy rice batter. 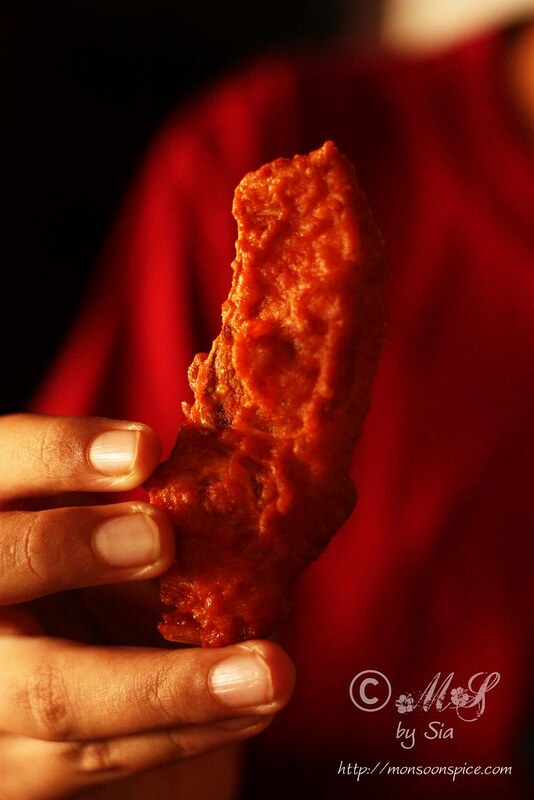 Make sure that the piece is coated well before dropping it gently into the hot oil. 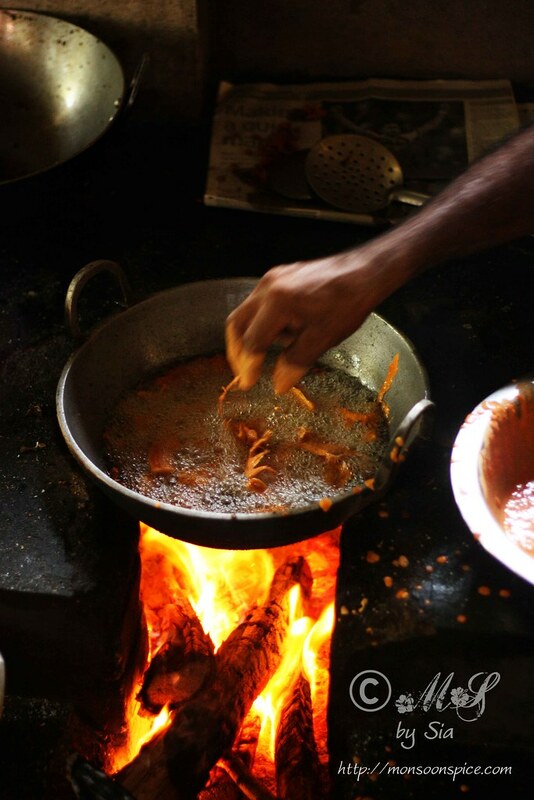 Deep fry the pakodas in batches until they turn golden brown and crisp. Serve them immediately on its own with a cup of strong coffee or tea and enjoy! Old newspapers are neatly spread to cover the floor from getting the floor stained from the white milky glue from tender jackfruits. Both the hands are oiled well for the same reason before cutting the tender jackfruits into two equal halves using the Met Katti. 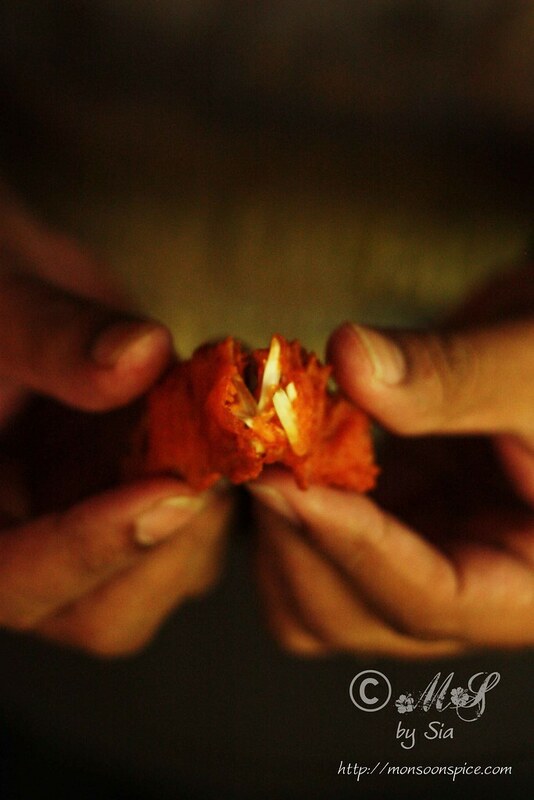 Then each halves are diced into large pieces before peeling the thorny green skins. 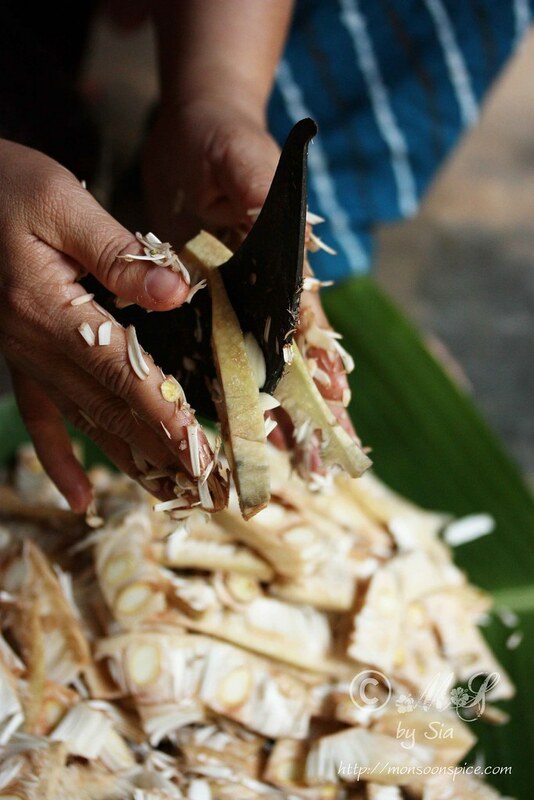 Once you have peeled all the pieces, then we can proceed to cut them into thin slices or small pieces for cooking. 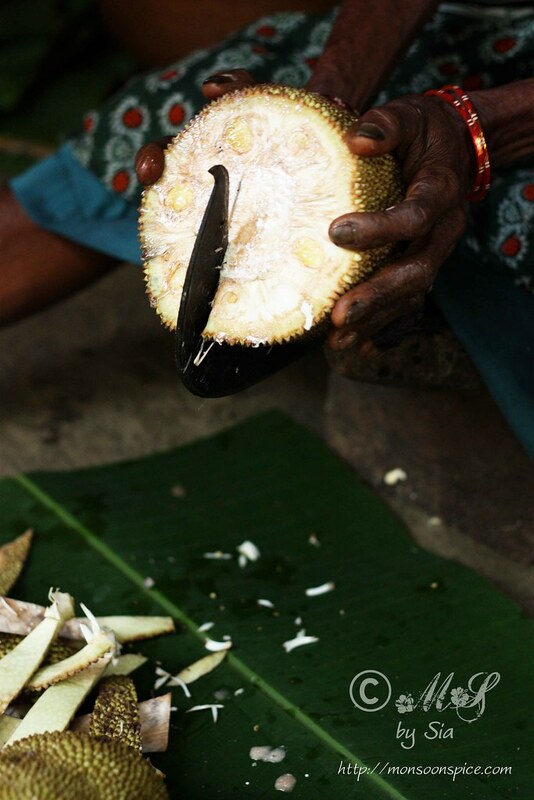 The cut pieces of tender jackfruit is immersed in a large bowl of diluted buttermilk or just plain water to prevent them from changing the colour. 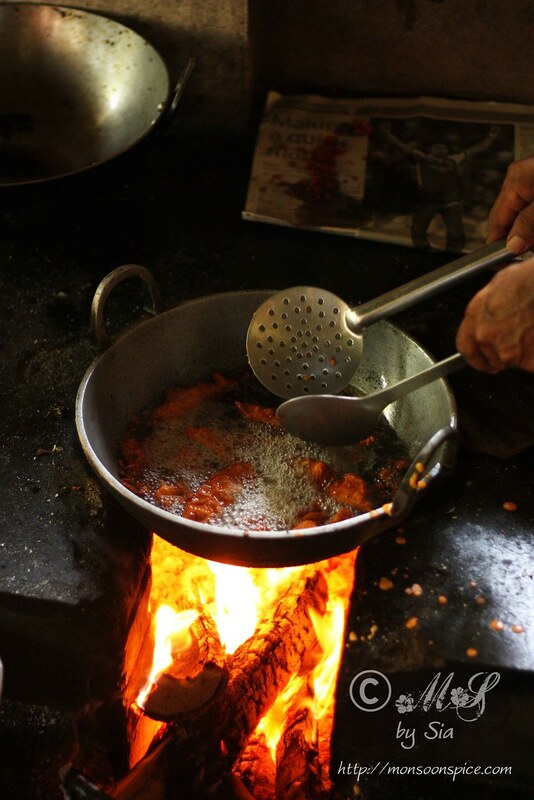 To test if the oil is hot enough, drop few drops of batter into the hot oil. The batter should slowly float to the surface of the oil. If it sinks to the bottom and stays there, then the oil is not hot enough. If the batter quickly floats to the top as well as browns quickly, then the oil is too hot. 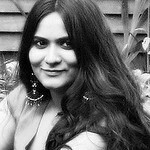 @Ambika, there are many recipes using tender jackfruit. You can make gassi, kodhel, majjige huli (links in this post) as well as biriyani, pickle, and many more. Wow Sia that is really such a beautiful recipe, a real treasure and love your even more pretty pictures..such a treasure really! Is this green jackfruit, or ripe jackfruit? 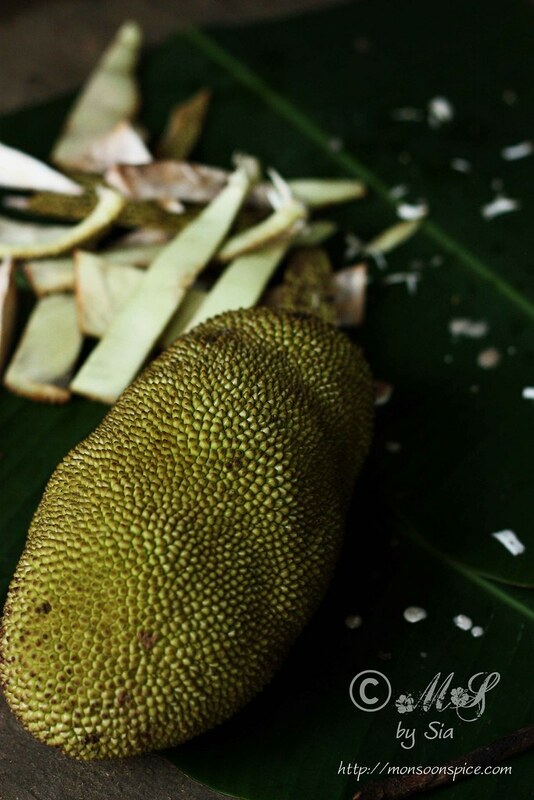 Do you know if you could use the green jackfruit from a can?